Hello beautiful casper&pearl girls! It was just one month ago when we were thanking you for 7,000 followers on our Instagram channel @casperandpearl, and in just a matter of weeks we've reached 9,000+, crazy right! 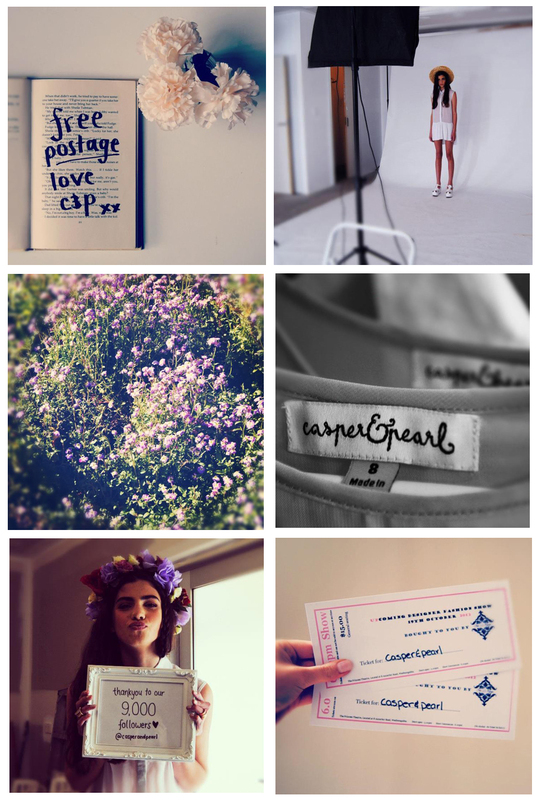 August was a huge month for us, it saw us shooting our first lookbook for a/w 2013 and we've picked up some amazing world wide stockists which will all be revealed soon! We also launched our online store and put up some pretty little pieces. And now were so excited to see what September will bring! I'm truly in love with your blog! Thanks for stopping by my blog! I would love to follow each other! Wow! Congratulations on 9000 followers. I can't wait to see your lookbook! :) Looks like it's gonna be a good one. I'm your new follower here and on instagram! congrats! so cool! thank you for leading me to your blog. i love what you are doing! maybe i can do the make up for your next look book!? i used be designer myself and am now make up artist and will be moving to Australia shortly from London. Congrats on 9000 followers! I am so excited for your new collection and worldwide shipping! That is amazing!!! Congrats girls! I'm really loving all of your captures. So clean, so chic. Keep on going :)! Hey, thanks for the nice words, it means a lot :). That pics are so cute! Love your blog, I'm following you! Congratulations! I love your dresses! And your instagram, I think I was follower 996 or some ridiculous number like that. Congrats to you all! You have great shots for instagram! Let's follow each other via Bloglovin'? I follow you now! congrats!! i love the second photo! You have really a fantastic blog. I adore it. These Instagram photos are gorgeous! Congratulations on reaching 9,000 followers! You have a lovely blog. love your blog - follow each other? omg! great photos! do you wanna follow each other? :D J.
you take some awesome pictures! because of that I've discovered yours! i really like yours, so i would love 2 follow you ..
Amazing blog you have dear, and thank you for the comment on my blog! I'd love to follow each other! I'm now following you on bloglovin, hope you do the same. Thanks so much for stoppin at my place. I loveee your blog, and hope we'll stay in touch!